There have been club-level endurance races for quite some time. 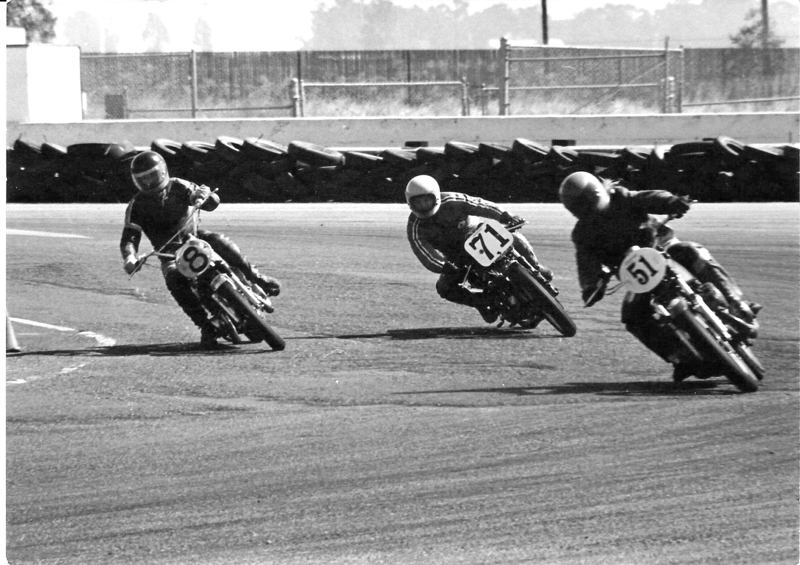 The AFM held a 100-mile event for Production bikes at Cotati Racetrack in 1964. That doesn’t sound like much today, but in 1964 getting a mostly-stock motorcycle to run at racing speeds for 100 miles was quite a challenge. When I was racing with the AFM in the late 1970s there were two endurance races each year, the well-known and popular Ontario Six-Hour race in Southern California, and the lesser known Sears Point Three-Hour at the Sonoma County track. My experience with endurance racing has been mixed. Here’s how it went. The 1975 Sears Point Three-hour. 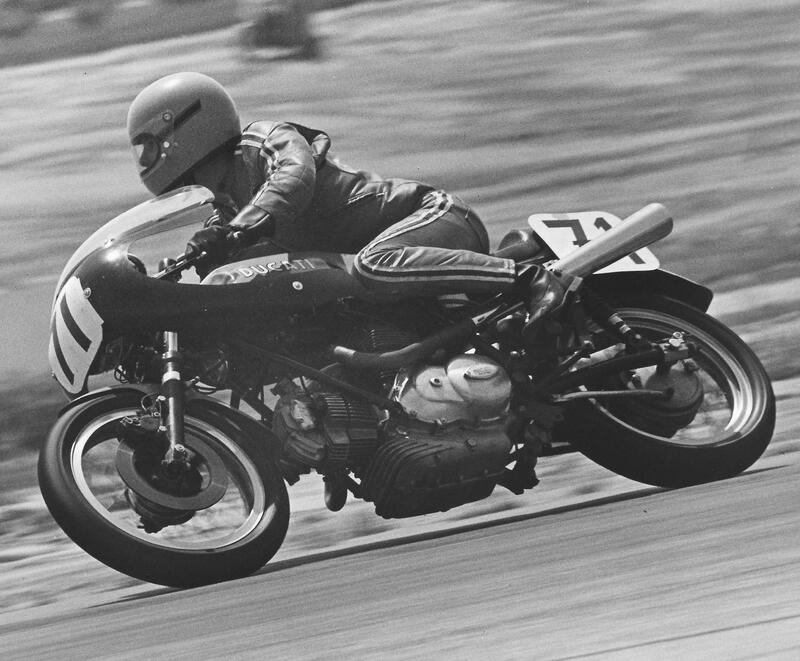 Toward the end of the 1975 season the AFM scheduled a three-hour endurance race at Sears Point. I think this was the first Three-Hour, the Northern California equivalent of the popular Ontario six-hour endurance race. The club knew better than to try running for 6 hours at Sears Point, feeling correctly that 3 hours at Sears was at least as exhausting as 6 hours at Ontario. The rules were simple: Production class bikes, 250cc and bigger, minimum two-person teams, maximum of one hour of racing per turn. I mentioned to a couple of racing pals I was considering racing my Ducati 750 Sport in the 3-hour and presto! A plan materialized. Noted action photographer Mush Emmons would be my co-rider with pals Jack and Ted working as pit crew. Mush was a top-five finisher in the very competitive 350 Production class with his RD350, so we knew he was quick. I was more of an unknown, but I owned the bike. This was the second-ever race for the Sport, after a so-so race at Ontario in July, finishing 7th out of 14 in the 750 Production class. I bought a Dunlop KR91 long-distance racing tire for the rear and a Dunlop KR76 tire for the front and a new drive chain. We geared for Sears by replacing the 40-tooth rear sprocket with a 42-tooth one. The crew installed all the new parts and tires, checked valve clearances, did some safety wiring, installed number plates and declared the bike ready. During practice Mush said the bike was sliding the rear tire on acceleration but we didn’t think a stickier tire would last the distance. We would have to use the traction control in our right wrists to limit tire spin. The gearing was just right. Our plan was to each take a one-hour turn and we would fuel the bike at each rider change, and we would split the final hour. The Sport had a 5-gallon gas tank that would give us a full hour of racing. I had the first turn in the race and surprised everyone, even myself, by running with the leaders. There were three of us up front for the first 30 minutes or so, with me being in third position but close behind two others. My lap times were consistent and decent at the 2-minute-4.5-second to 2:06 range. At about the half-hour mark I made an attempt to get into second place and over-cooked it going into turn 11, ran wide and let the lead two get away a little bit. In Sears Point turn 11 during the Three-Hour. Three rather different cornering techniques. Photo by VA. The team saw my error and the next time I came past the pits Ted held up a sign with “HOLD POS!” written on it. That settled me down a bit and I caught back up with the lead two but didn’t try to get around them. Somewhere near the 50-minute mark I tried to lap a slower rider in the turn 7 hairpin by riding around the outside. Traction was poor off line and when I got on the gas the rear tire spun and I crashed, falling onto the right side. It was a low-speed, low-side get off so I wasn’t hurt and the bike was in good shape except for a bent shift lever. I picked up the bike and dashed into the pits where they fueled the bike and straightened the shifter. We lost about one and a half laps during the repair. My turn was nearly up anyway, so I got off and Mush took over. He flew around the track, laying down laps of 2:03 – 2:04; his fastest was a 2:02.8. In about 10 laps Mush caught up to the leader, then the next lap he didn’t come around. He had crashed unhurt in the fast esses section of the track just as he was about to pass to get back on the same lap as the front runner. The bike had slid tail-first into the hillside and the seat was smashed and the rear sub-frame was bent. We didn’t have a spare seat so our race was over after one hour and a few minutes. When we got the bike back the problem was obvious – the rear tire was shredded. It was more than half gone after only about an hour of racing. Even if Mush had kept it upright we would have had a tough time finishing the full three hours. I was hooked, though, really excited. I liked being competitive for a change. I continued racing the 350 Desmo in the GP class, but I started making plans to race the Sport in the 750 Production class in 1976. Score so far: Me 0, Track 1. In 1976 I was busy trying to win the AFM’s 750 Production Class with the Sport, and I didn’t take part in the endurance races. 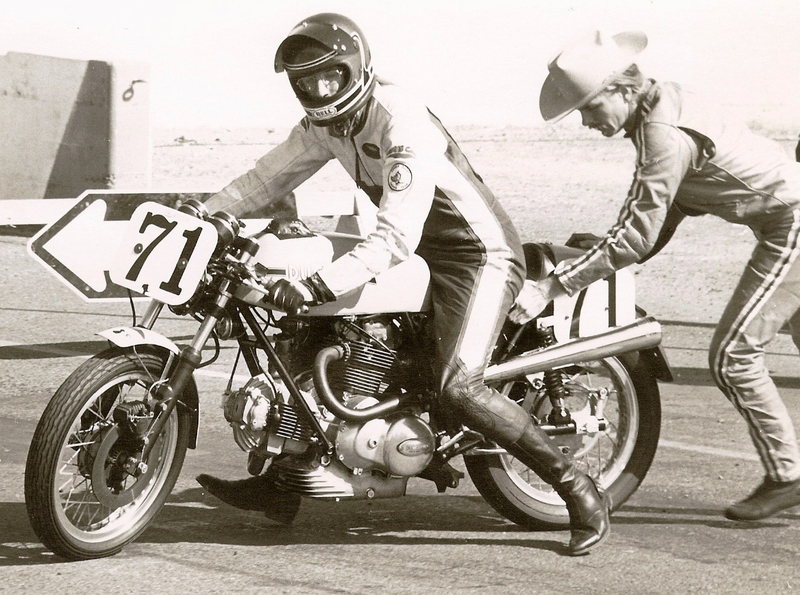 My next endurance race was the 1977 Ontario 6-hour, with my pal Vance Breese. The Ducati 750 Sport in the 1977 6-Hour race. The race is documented on the page “ZV. The Ducati Sport goes Endurance Racing” of this blog. To summarize, we ended up 4th overall and 1st in the 750 class, an excellent result. Score: Me 1, Tracks 1. I don’t think there was an endurance race at Sears Point in 1977. I can find no record of one in my old copies of the Lap Times. This was the Six-hour when it rained for the first five hours. The race is well documented on blog page “ZX. The Wet Ontario Six-hour.” To summarize, we led the race for the first hour but water worked its way into the electrics and we had to retire. Score: Me 1, Tracks 2. The 1978 Sears Point 250-mile. In 1977-78 I was racing bikes owned and tuned by Dale Newton. Dale decided to make a bike ready for the August endurance race at Sears Point. In 1978 the race was a 250-mile endurance race, not three-hours, and the rules had been relaxed a bit to let Superbike-style motorcycles enter. Vance and I were going to race one of Dale’s Ducatis. There were two other Superbike-spec motorcycles entered, a Kawasaki and a BMW. At the start three bikes ran away from the field. Billy Addington (Kawasaki, partner Kurt Kritikcos) got the hole shot with me right behind. However, on the first lap I got into turn 2 too hot and drifted wide. Harry Klinzmann (partner Dave Emde) on the ex-Butler and Smith BMW, took advantage and shot into second place. Billy continued to lead for a few laps until Klinzmann slipped past and began slowly pulling away. At the 15 minute mark Addington overcooked it coming out of the slow turn seven and crashed, gifting second place back to me. I moved up to Klinzmann’s rear wheel. I was planning to pass him in the turn 6 Carousel, but he took the entry line I was going to use. OK, I thought, next lap I’ll use a slightly different entry and get him. When we got around to the Carousel again Harry took a completely different entry line than the lap before. For the next several laps he didn’t take the same line through the Carousel once. I don’t know if he was doing it on purpose to block me or if that was just his riding style, but it worked. I decided not to pass but to just follow him for a while and see what developed. Just past the 30 minute mark the big BMW went onto one cylinder going through turn 10 and Harry went directly into the pits, leaving me in the lead. Klinzmann had somehow knocked one of the bikes carburetors off the rubber inlet mount. Some quick work by the San Jose BMW crew and Harry was out again, but a lap and a half behind. I enjoyed the lead for only about 15 minutes. Going into the tight right-hand turn four, I downshifted while braking and suddenly felt something hard whack me in the back. WTF? Is my tire coming apart? I drifted wide and momentarily ran off the edge of the pavement. Once back on the asphalt and safely off the racing line I looked down and saw my drive chain dragging on the ground. I coasted up the hill to turn six, picked up some speed on the downhill part and turned right onto the drag strip. I got off the bike and waited for a clear spot then pushed the bike across the track near turn one, and back to the pits. Dale quickly put on a new chain. We refueled and Vance went out for a turn. The BMW team had regained the lead while I was pushing the Ducati around. We were several laps down at this point, but there was still maybe three hours left. A lot can happen in three hours. Harry Klinzmann (shown) teamed with Dave Emde to win the 1978 Sears Point 250-mile endurance race. The photo is a scan of a half-tone from a nearly 40-year old newspaper, hence the poor quality. Later in the race it was my turn again. I don’t remember what the standings were at that point but I knew we still needed to hurry. After a few hot laps I came up on a rider on a Yamaha RD350 going rather slowly through the turn seven hairpin, and I set up to pass him before the little left-right wiggle between turns seven and eight. The guy surprised me by getting on the gas hard once he was straightened up. Those RD350s were pretty quick and he was able to stay in front and I had to go off-track or hit him. By convention, the rider making the pass has to do it safely because the other guy probably doesn’t know you are there. A collision would have been my fault. I ran into the tires protecting the Armco and crashed. I don’t remember what was wrong with the bike after the crash, but it ended our effort. The Klinzmann/Emde team had no more problems and won the race. Score: Me 1, Tracks 3. 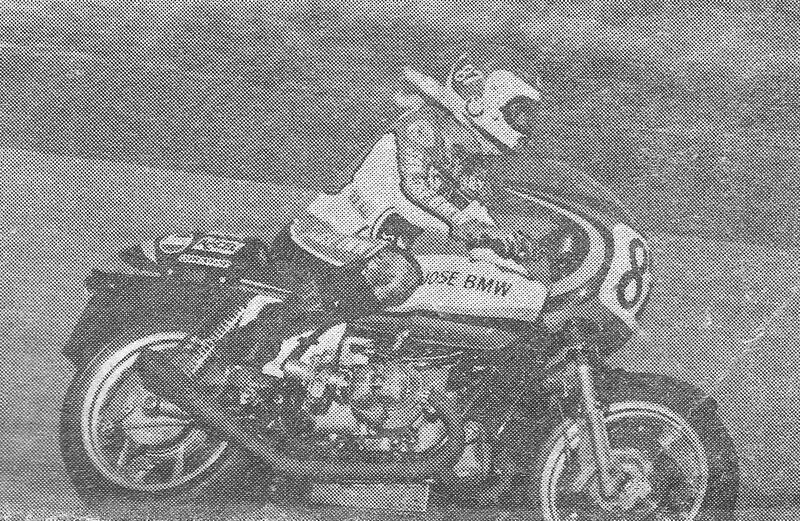 Dale had to withdraw from racing in 1979 and I had become the rider for the San Jose BMW team, riding the bike Klinzmann and Emde had teamed up on the previous year. Frankly, my recollection of this event is a bit hazy. If I recall correctly our motor broke in practice on Saturday and a local BMW fan offered to let us use his motor. He had a R90S with a turbo-charger! The team pulled the broken superbike motor from the chassis and slotted in the turbo-charged engine. It was a rocket in the two long straights at Ontario but the turbo-lag made it a bit tricky in turns. It ended up being a moot point because that motor quit working on Vance during Sunday practice. When the bike got back to the pit Chris, the mechanic, asked Vance to describe the failure. He then opened up a viewport at the back of the motor and spun the rear wheel. “Yeah, the bolts are broken,” he said. Chris explained that somewhere in the drive train are a set of bolts that don’t hold up to racing stress, and the superbike motors had them replaced with higher grade bolts. We all thanked the fellow who loaned up the engine, and the San Jose BMW guys promised to fix it up for him, but our racing was done. I spent the six hours wandering around seeing how everybody else was doing. Final Score: Me 1, Tracks 4. Conclusion: Endurance racing is harder than it looks.